Launching NASA astronauts to the International Space Station aboard commercial spaceships may have its risks, but the payoffs from lower-cost flights to the orbiting outpost, and expanded scientific use of the microgravity environment, are expected to be considerable, industry officials told lawmakers today (June 20). William Gerstenmaier, associate administrator for NASA's Human Exploration Operations Directorate, testified before the U.S. Senate Committee on Commerce, Science and Transportation Subcommittee on Science and Space this morning (June 20) to discuss the risks and opportunities associated with the burgeoning commercial spaceflight industry. By supporting the development of new private spaceships, NASA will be able to purchase flights to and from the space station with reduced cost and oversight. "These two things are allowing NASA to focus its talents on the bigger goals: the utilization of the International Space Station and developing the next generation of hardware and skills that will allow us to extend human presence in the solar system beyond low-Earth orbit," Gerstenmaier said. Gerstenmaier stressed that as these spacecraft undergo rigorous testing, there may be setbacks, and it is important for the government to understand the setbacks and not clamp down on the industry in ways that will stifle progress and innovation. "We need to anticipate and not overreact to these problems," Gerstenmaier said. "These problems will occur and should not be viewed as a major failure." The hearing included comments from Pamela Melroy, senior technical adviser in the Office of Commercial Space Transportation at the Federal Aviation Administration (FAA), Gerald Dillingham, director of civil aviation issues at the U.S. Government Accountability Office, Michael Gold, director of D.C. operations and business growth at Bigelow Aerospace, and Michael Lopez-Alegria, president of the Commercial Spaceflight Federation. Several of the representatives spoke about the anticipated benefits of commercial spaceflight, which include being able to use the International Space Station to its full research potential, while also providing a platform for private companies to perform research and development in microgravity. Scientific experiments, such as vaccine development, already occur aboard the space station, but having more cost-effective means of reaching low-Earth orbit could revolutionize certain industries, such as pharmaceuticals and materials science. "That's just scratching the surface," Gold said. "We have to develop regular, robust and reliable access to space to bring that to fruition." Once commercial vehicles are available, NASA intends to add another astronaut to the space station's typical six-person crew. This means purchasing four seats per flight, at an anticipated rate of two flights a year, Gerstenmaier said. "We're still off investigating what makes sense," he said. "It'll be on the order of about two flights per year with four confirmed seats on those flights, but we're looking at how we can use those seats effectively." 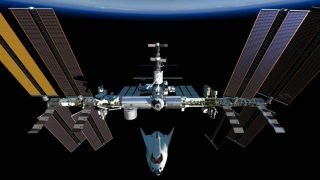 Today's hearing comes after NASA and the FAA announced earlier this week that they had signed an agreement to establish licensing standards for commercial missions to the International Space Station.